Acetamide test is used to test an organism’s ability to utilize acetamide by deamidation. It is used in the qualitative procedures to differentiate non-fermentative, gram negative bacteria, especially Pseudomonas aeruginosa, on the basis of acetamide utilization. To differentiate microorganisms based on the ability to use acetamide as the sole source of carbon. The medium contains acetamide as the sole carbon source and inorganic ammonium salts as the sole source of nitrogen. Growth is indicative of a positive test for acetamide utilization. When the bacterium metabolizes acetamide by the enzymatic action of an acylamidase, the ammonium salts are broken down to ammonia, which increases alkalinity. The shift in pH turns the bromthymol blue indicator in the medium from green to blue, indicative of a positive test. NaCl (5 g), NH4H2PO4 (1 g), K2HPO4 (1 g), agar (15 g), bromthymol blue indicator (0.8 g), per 1000 mL, acetamide (10 g), pH 6.8. Inoculate acetamide slant with a needle using growth from an 18- to 24-hour culture. Do not inoculate from a broth culture, because the growth will be too heavy. Incubate aerobically at 35°-37°C for up to 4 days. If equivocal, the slant may be re- incubated for 2 additional days. Positive: De-amination of the acetamide, resulting in a blue color. Negative: No color change or development of a yellow color. 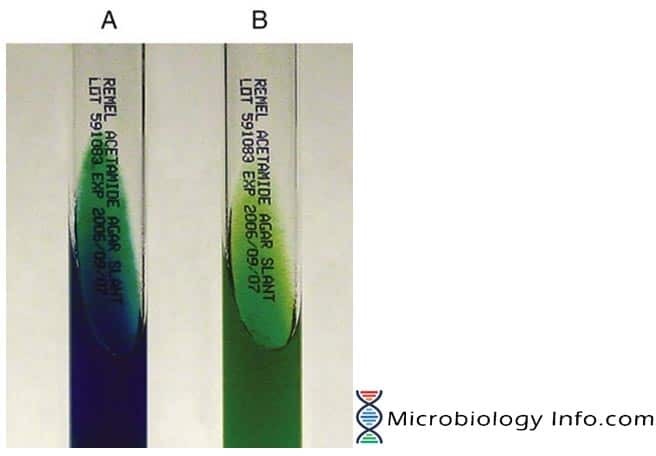 The test is recommended for differentiating Pseudomonas aeruginosa from other non-glucose-fermenting, Gram-negative rods. Growth without a color change may indicate a positive test result. If further incubation results in no color change, repeat test with less inoculum. Acetamide hydrolysis is not a reliable test for identification of Pseudomonas strains which produce pyocyanin. Only 38% of non-pyocyanin-producing strains of P.aeruginosa will produce a positive result in Acetamide Agar. Further biochemical testing may be necessary for definitive identification. Tille, P. M., & Forbes, B. A. (2014). Bailey & Scott’s diagnostic microbiology (Thirteenth edition.). St. Louis, Missouri: Elsevier.